I had just started my wordpress blog around this time two years ago. Funny how that works out. Fall is the season of renewal - when we're ready to start new challenges, isn't it!? 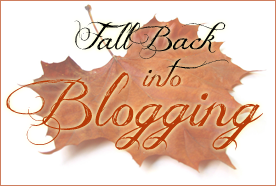 I was in a blog slump last year, so my post isn't until mid-October! Sounds like we're a lot alike, only I'm less self aware. I really liked every post you shared.